Yeah! What Evans and Novak said. From the latest Evans-Novak Political Report: "President George W. Bush's attempt to revitalize his Iraq War policy has been a political failure. His 'surge' in troops won no converts, and all efforts now are based on attempting to prevent a negative resolution from being passed in the Senate." "The gloom pervading the Republican Party cannot be exaggerated. The long-range GOP outlook for 2008 is grim. The consensus is that U.S. troops must be off the ground of Iraq by next year to prevent an electoral catastrophe in the next election." "Iraq, one of Bush's top political advisers now notes, is a black hole for the Republican Party. A nationally prominent Republican pollster reported confidentially on Capitol Hill after the President's speech that if U.S. boots are still on the ground in Iraq and U.S. blood is still being spilled there at the end of the year, the GOP disaster in 2008 will eclipse 2006." It is just like I've been saying. The Wall Street Journal has a good rundown on the race for the White House in 2008. I think it is interesting that so many more Democrats have been willing to declare their candidacies while most of the Republican crowd is hanging back and hiding behind their “exploratory committees.” I think they know this is the Democrats’ race to lose. As to the undeclared candidates, I think Hillary is the only one from either side guaranteed to still get into the race at this point. While it is still ridiculously early to being making predictions, I’m going to throw one out anyway. I think it will ultimately come down to Hillary Clinton vs. John McCain with Hillary coming out on top. Republicans will pull out all the stops in their efforts to trash Hillary, but I think their past efforts have given her a limited immunity that will allow her to emerge from the onslaught mostly unscathed. I think the race will be nearly a repeat of the 1996 Clinton-Dole race with Hillary in the driver’s seat and McCain playing the role of the elder Republican statesman who is past his prime. McCain, they will say, missed his chance to be president when he lost the 2000 primary to Bush the Younger, just like Dole missed his chance when he lost the 1988 primary to Bush the Elder. 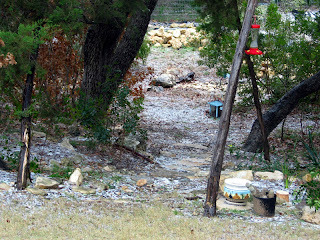 I’m disappointed that we didn’t get any snow, but the ice was still pretty.